Whether you’re looking for precious metals or crude oil, minerals are rarely available in places that are easily accessible. 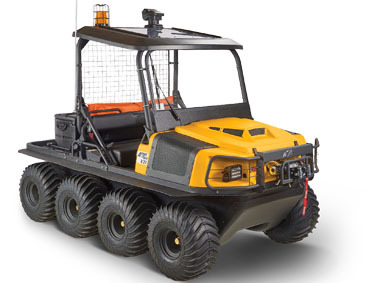 Argo’s line of XTVs can be with you every step of the way, helping you with everything from exploration and surveying to personnel and equipment transport. Why use an Argo XTV? A low center of gravity keeps the vehicle stable on the roughest terrain, while the massive footprint created by the tires prevents the vehicle from damaging the environment you’re working in. 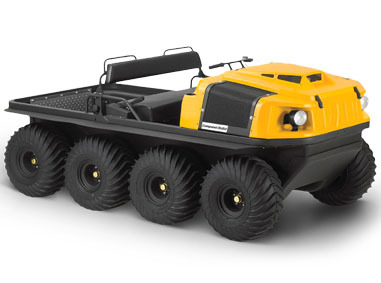 This also makes Argos better at crossing muddy terrain than just about any other vehicle on the market, while adding the flexibility of moving between water and solid ground without having to switch modes of transportation. For the most challenging terrain, a set of treads can be fitted over the tires to better match the surface you need to cross. 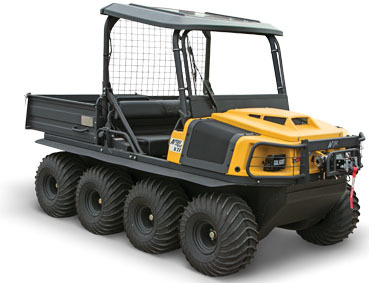 Since these vehicles can do the job of a UTV and boat without spending the time switching between the two, work can be done faster and without docks, bridges, or other infrastructure in place. With models that can carry up to 6 people, these XTVs are a great choice when you need to get a crew to a remote location. Need to move supplies? Argo has models with dump beds and storage compartments, or you can add a trailer hitch and one of Argo’s amphibious trailers, which can go anywhere the XTV goes. Even the largest model, the Conquest XTi, is just 65 inches wide and 79 inches tall, so you can pass through openings that would be inaccessible to full size automobiles, but without sacrificing the carrying capacity of a UTV. In an area where you can’t set foot on the ground? Catwalks can be added to access the rear without getting out of the vehicle. What about injuries? Argo has partnered with Ferno to create a series of compatible accessories including stretchers, baskets, and immobilizers to help you evacuate injured crew members safely and quickly. How do these vehicles work in the field? When BHP Billiton began the RGP 5 project in Australia’s Port Hedland harbor, they quickly found that operating hours were limited due to the coastal conditions at low tide. When the ocean receded, a wide strip of muddy sand separated the sea from the land, making it impossible to cross by foot or with traditional vehicles. By introducing Argo XTVs to the project, workers could be shuttled to a barge for transport to the oil rig, while scientists could collect samples directly from the mud to monitor environmental conditions. Adding amphibious trailers have further expanded their use, making it easy to ferry equipment across the exploration site.